Sitting invigilating exams in ice hockey stadiums (yes! ), listening to fascinating PhD defences at the end of a busy term, or travelling around by train for my job: perfect moments to start paper piecing. I seem to gain mental focus through busy hands, as no doubt women have done for centuries. I am finding this is an increasingly good way of harnessing calm in moments of intensity. Nobody has dared tell me off quite yet, although I do find curious stares or kind questions amusing. It doesn’t seem worse than colleagues tapping away on mobile phones during meetings, Pretending To Be Important. But hand stitching in Switzerland is for grannies, they seem to imply, not red-haired feminist academics… Time to change that, one stitch at a time. A little cardboard box that once held exquisite local Swiss handmade chocolates is the perfect little travel case. Those are chocolates I had to eat quickly, as I was just looking for the perfect case. It fits into my handbag and follows me around. Sometimes, in a tense professional meeting, just knowing it is close by makes me smile. Even if I don’t always dare to take it out. 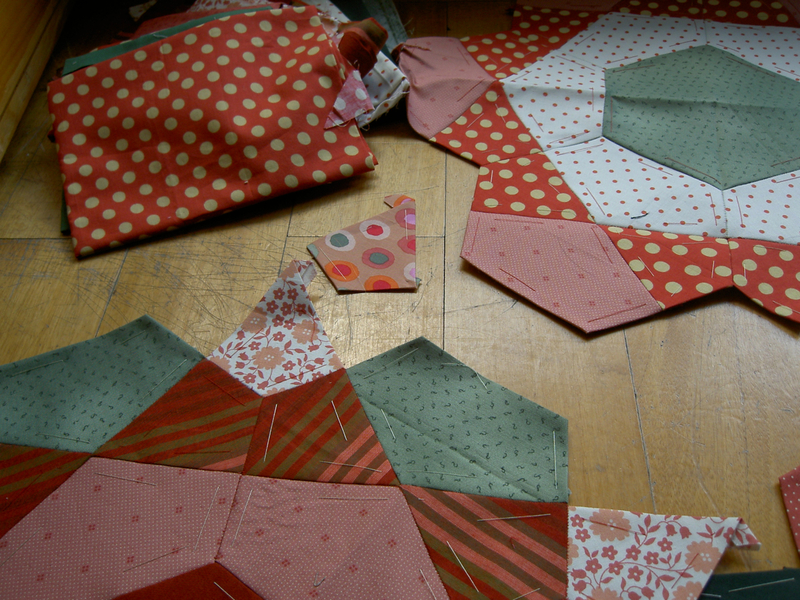 I’ve been stiching these little hexies, in various places, with no particular plan. I had thought it could be a cushion, but then I do really prefer making quilts, so if I just keep going, then who knows? 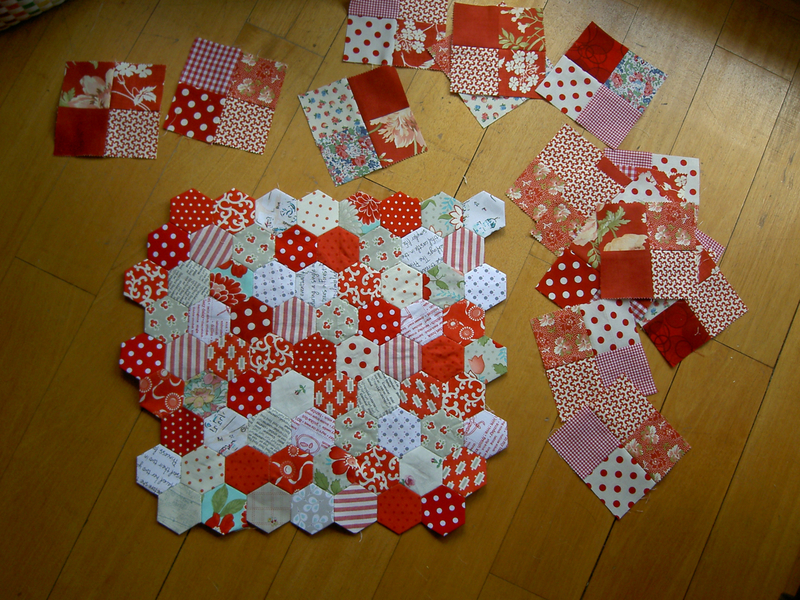 It struck me that this might be merged with another red quilt project I have on the go. These little 4.5inch four-patch blocks have been piling up. I am still stuck about how to put the two together, maybe with the hexies in the middle, and the little blocks around it? I’d love to find examples of something similar. 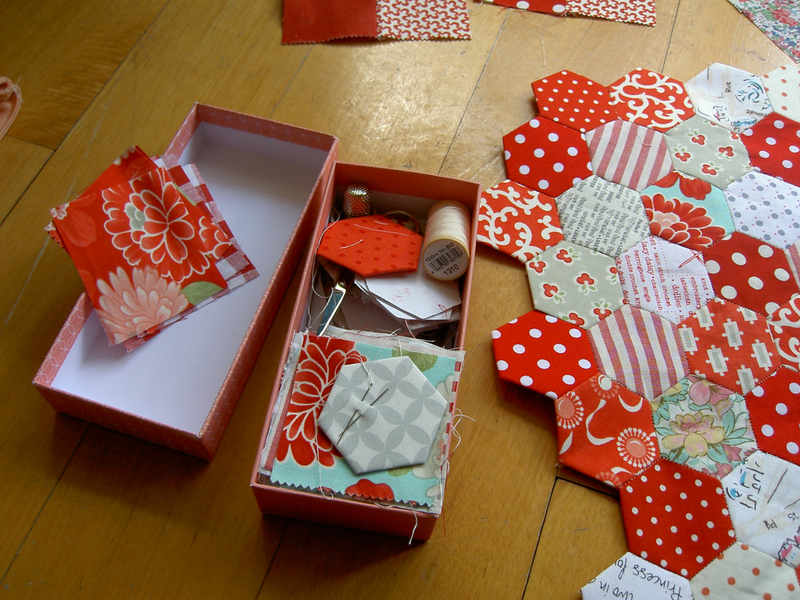 I like the idea of mixing piecing with paper piecing. I am linking this up with Jessica Alexandrakis’ book Quilting on the Go that featured, discreetly, in a photo in a previous post. A lovely source of inspiration. I suspect that she’d disapprove of my use of glue to baste them, but it is so much quicker. 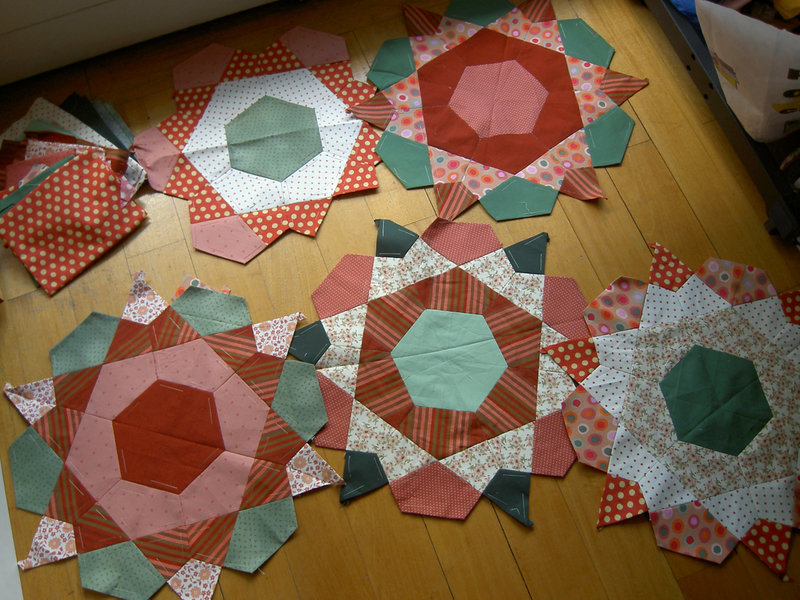 I got a bit bored of making Rose Star blocks because I got so bored with all the basting, and unsure about my choice of colours. Maybe this blog-link-up will encourage me to get back to those? I had used normal-weight printer paper. The size of the pieces meant that the paper kept popping out, so I had to baste through the paper to hold them in place. Perhaps, now that I have discovered glue, I might try with that with these? But I suspect the paper would rip when I tried to unstick them, unlike the nifty little tough Japanese pre-cut hexies I am using with the hexies. How many Rose Stars left to make? How many hexies left to stitch? I have no idea, but I’m grateful for input and encouragement! I just keep adding little squares to the chocolate box, and work my way through them when they run out. As for the Rose Stars, perhaps my stitching with the girls tonight will get me back in the grove. I love the idea of keeping it in a little box and taking it with me everywhere, for those odd moments – perhaps a visit to Ladurée beckons, one of their pretty macaroon boxes would be just perfect, I feel, to help keep me motivated! 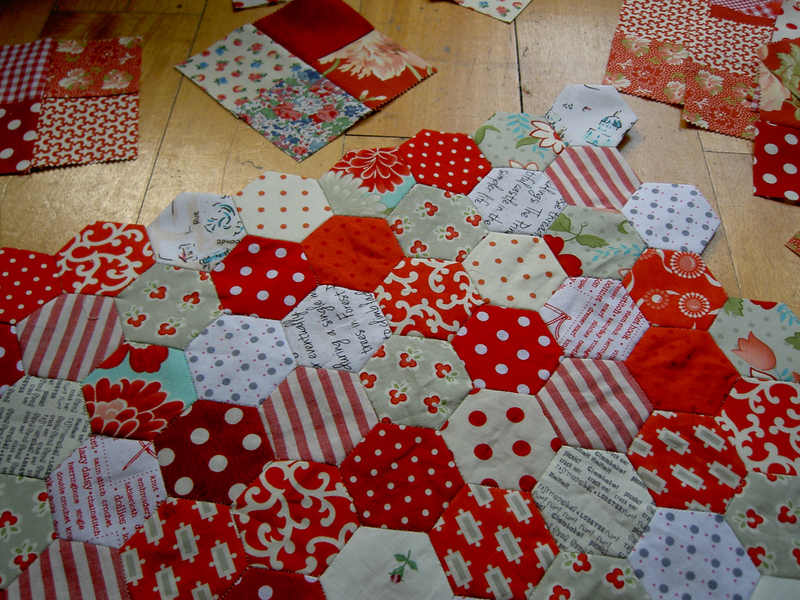 I love seeing the hexies done all in reds. It makes for a pretty quilt. I’ve also started an EPP project, with no particular plan. I just like doing them! Your hexagon’s are gorgeous! I can completely understand how having your hands busy keeps your mind focused. No disapproval!! If glue works for you, use it!